VANCOUVER, BRITISH COLUMBIA--(Marketwired - July 10, 2017) - First Mining Finance Corp. (TSX:FF)(OTCQX:FFMGF)(FRANKFURT:FMG) ("First Mining" or the "Company") is pleased to announce the fifth set of assay results, comprising 11 drill holes (Tables 1 and 2) from its Phase 1, 24,000 metre diamond drill infill program on its 100% owned Goldlund Gold Project ("Goldlund"), located near the town of Sioux Lookout in northwestern Ontario, Canada. 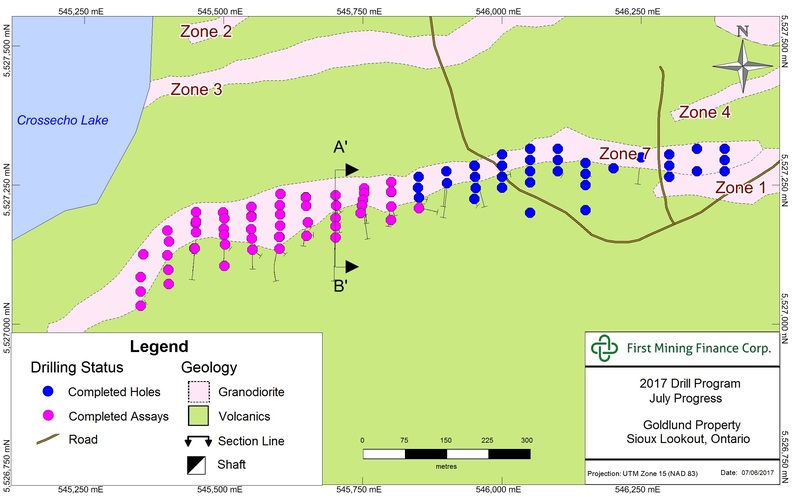 The goal of the 2017 drilling campaign at Goldlund is to upgrade Inferred resources into the Measured and Indicated categories, with the majority of the drilling focused on Zone 7 and Zone 1 (Figures 1 and 2), and to gain further knowledge of the geology and gold mineralization in preparation for a Phase 2 drilling program. The Phase 1 drilling program, comprising 100 holes (24,300 metres), was completed at the end of May and the remaining assay results from the Phase 1 program will continue to be released in batches as they are received. Since the commencement in January of the Phase 1 drilling program, the Company has issued four press releases (on April 25, May 2, May 24, and June 20, 2017) comprising a total of 49 drill hole results. With today's latest press release, the Company has now released the results for 60 drill holes from the Phase 1 program, of which 57 drill holes contain significant intervals of gold mineralization, a 95% success rate. Commenting on the results, Dr. Chris Osterman, CEO of First Mining stated, "We are very pleased with the success of the Phase 1 drilling program, and as a result, we are now re-mobilizing a drill to re-commence drilling at the Goldlund Project to test the deeper portions of Zone 1. This series of deeper drill holes is expected to test the granodiorite dike hosting gold mineralization 50 to 200 metres below the historic mine workings in Zone 1. We anticipate that this drill program could evolve into a Phase 2 drill program once all assays are received by the Company of the first 100 holes." In addition, Keith Neumeyer, the Chairman of First Mining, stated, "So far during the 2017 drilling campaign at Goldlund we have intersected gold mineralization in 57 out of the 60 holes drilled which is an impressive accomplishment. Given this excellent success rate, we have decided to send the rigs back to work to continue to drill at Goldlund as we develop a more concise Phase 2 program." Gold observed during the current drilling program at Goldlund occurs both as fine disseminations in quartz vein stockworks and as more discrete larger grains up to 2 mm spatially associated with pyrite in the quartz veins. Calaverite, a gold telluride mineral, has been noted occasionally in higher grade intervals on fracture surfaces in the quartz veins. Higher grade gold distribution in the granodiorite dike is often, but not always, associated with zones of more intense quartz stockworking and potassic alteration. 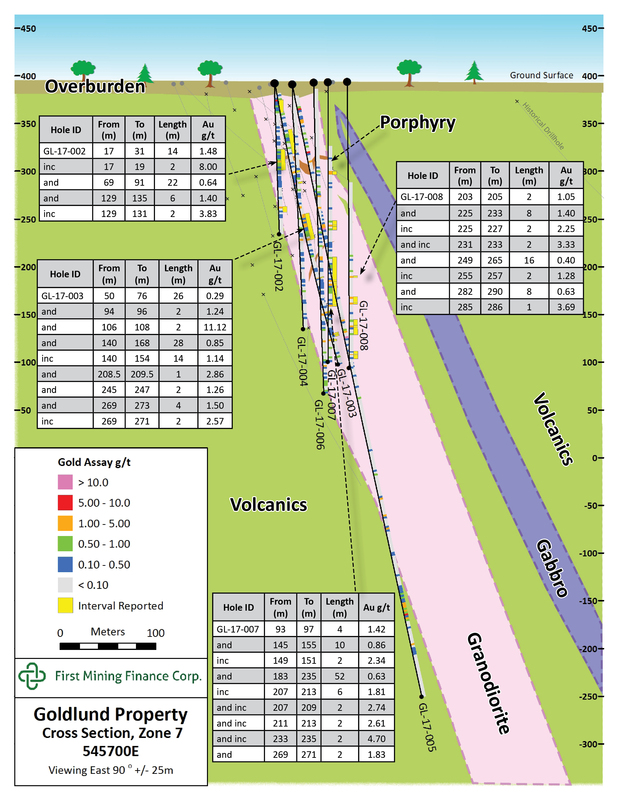 Figure 2 above displays a cross-section of the geology and gold mineralization with drill holes GL-17-02 to GL-17-08. Forward-looking statements are frequently, but not always, identified by words such as "expects", "anticipates", "believes", "intends", "estimates", "potential", "possible", and similar expressions, or statements that events, conditions, or results "will", "may", "could", or "should" occur or be achieved. Forward-looking statements in this news release relate to, among other things: the potential results of the remainder of the Company's Phase 1 drilling program at Goldlund and the timing of the dissemination of such results by the Company; the re-mobilization of drills at Goldlund for the purposes of drilling deeper holes in Zone 1; the Company's expectation that a Phase 2 drilling program at Goldlund will confirm that Zones 1 and 7 are connected and continuous; plans relating to a Phase 2 drilling program at the Goldlund project and the anticipated timing of such a program; any upgrade to, or expansion of, the resources on the Goldlund project; and the potential for further value to be unlocked at the project. There can be no assurance that such statements will prove to be accurate, and actual results and future events could differ materially from those anticipated in such statements. Forward-looking statements reflect the beliefs, opinions and projections on the date the statements are made and are based upon a number of assumptions and estimates that, while considered reasonable by the respective parties, are inherently subject to significant business, economic, competitive, political and social uncertainties and contingencies.